The National Institutes of Health reports that eye screenings in schools miss half of the children that have vision problems. That's why the American Optometric Association (AOA) recommends thorough eye exams starting at age three to help children get a jump start on learning. Our doctors enjoy working with children and we understand the importance of good vision on learning, and self-esteem. Children often do not know they cannot see well and are unable to communicate their vision needs. No worries, our doctors can work with children, even before they know their alphabet, and they can help give them the edge they need, to learn their best. We also are trained to help ﻿protect your children's eyes﻿ with sports glasses, at package prices that parents love. 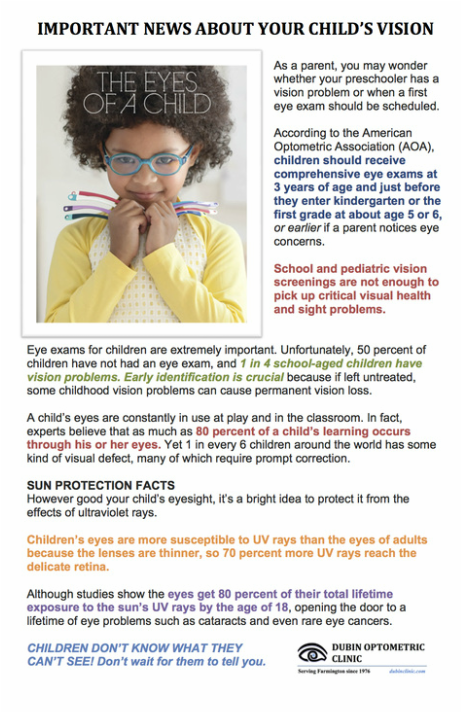 Stop in and see all we have to offer to cater to your children's vision needs.